Thousands of students from varsities across the country braved the winter chill to march from the Red Fort to Parliament Street in Delhi on Thursday to demand better employment and educational opportunities. More than 50 youth groups, students’ unions and organisations came together in December last year to form the Young India National Coordination Committee, under whose banner the ‘Young India Adhikar March’ was held this afternoon. Starting with the historic Red Fort in the background, students carrying red flags, placards with messages like ‘Enact Rohith Act’, ‘End 13-point roster’ and ‘Where is Najeeb?’ walked through the busy Daryaganj-Barakhamba Road stretch to the Parliament Street. 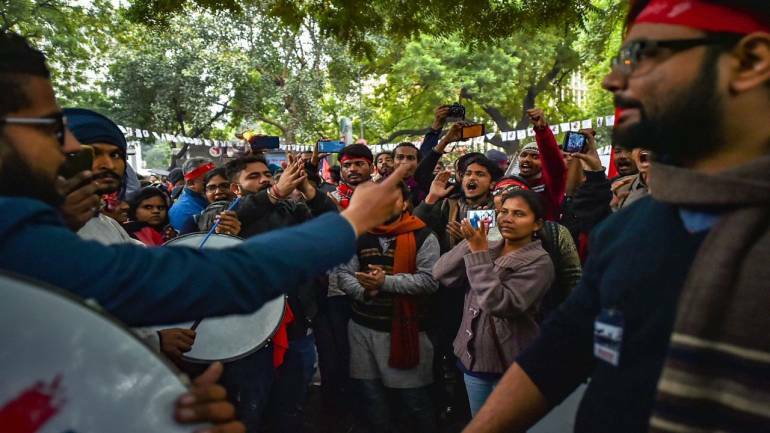 Slogans of ‘Inquilab zindabad’, ‘ab jumlebaazi nahi chalegi’ resonated in the heart of Delhi as students from institutions like Ambedkar University, Delhi University, Allahabad University, Hyderabad University marched, bringing traffic to a halt on several major roads and intersections. The officer said that 11 companies of outside force, with each comprising 70 personnel, accompanied the students along with local police personnel from north, central and New Delhi police districts. Police said the gathering was of around 4,000 people. DMK MP Kanimozhi, who addressed the students at the end of the march, said many young Indians have come to free the country from “this fascist government”. “We know how students have been silenced ever since this government came to power. Today we are here to say in one voice that we won’t tolerate this anymore. I am so happy to see you coming together against this government and intolerance,” she told the gathering. Samajwadi Party MP Dharmendra Yadav said the ‘JP movement’ had dislodged the government and this movement by the students also has the same potential. “We stood with Kanhaiya, Shehla in 2016 when no parties supported them. Our party has always taken up the issues of jobs, privatisation of education and students,” he said. Former JNU students’ union president Kanhaiya Kumar also took to the stage to express solidarity with the students. Kumar’s one-liners revved the crowd with loud cheers and slogans. “It seems Modi-ji has been in election mode right from the time he was elected. He speaks but has not been working. In the first year, Modi-ji was talking about cleaning Ganga and in the second year, he was talking about his own mother but when demonetisation came, he made his own mother stand in the queue. Then the issue was about ‘gai maata’,” he said. Kumar said the government’s “anti-people policies” will be shattered. Gujarat MLA and Dalit activist Jignesh Mevani said there are only 100 days left for the election and this elections will ensure ‘ghar waapsi’ for the prime minister. “But we do not want to keep him in Gujarat,” he quipped. He said the government which will come to power after the Lok Sabha polls should employ people in the 24 lakh sanctioned government jobs within 100 days and if it failed to do so, they would again come back to Parliament Street to register their protest. All India Students Association (AISA) national president Sucheta De said students from all the universities who have been branded ‘anti-nationals’ have come here to place their demands. Several issues were raised at the march including the disappearance of JNU student Najeeb Ahmed, bringing back the 200-point roster for faculty appointments, absence of adequate facilities at the Delhi School of Journalism despite the students being charged high fees and removal of hostel curfews for women. “Fill all vacant government jobs and end the regime of paper leaks and corruption in recruitment. Spend at least 10 per cent of the budget on education. Stop the policy of school closure, seat-cut, fund-cut, fee-hike and reservation-cut in higher education,” the ‘Young India Charter’ released by the students’ groups said. “End gender discriminatory rules, ensure girls’ hostel and effective anti-sexual harassment cells. End saffronisation of education. Ensure academic freedom and freedom of expression in campuses. Fulfil constitutionally-mandated reservation. Institute anti-discrimination cells in all campuses,” it added.